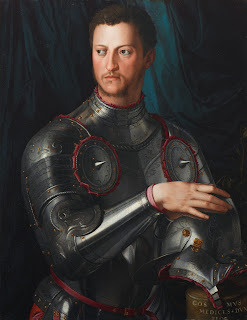 The second duke of Florence and first grand duke of Tuscany, Cosimo I, died on this day in 1574 at the Villa di Castello near Florence. Cosimo had proved to be both shrewd and unscrupulous, bringing Florence under his despotic control and increasing its territories. He was the first to have the idea of uniting all public services in a single building. He commissioned the Uffizi, which meant Offices, a beautiful building that is now an art gallery in the centre of Florence. Cosimo was the great-great-grandson of Lorenzo the Elder, whose brother was Cosimo the Elder but played no part in politics until he heard of the assassination of his distant cousin, Alessandro. He immediately travelled to Florence and was elected head of the republic in 1537 with the approval of the city’s senate, assembly and council. He also had the support of the Holy Roman Emperor, Charles V. The Emperor’s general defeated an army raised against Cosimo, who then had the principal rebels beheaded in public in Florence. Cosimo began to style himself as a duke and sidelined the other Government bodies in the city. As the Emperor’s protégée, he remained safe from the hostility of Pope Paul II and King Francis I of France. Cosimo launched an attack on Siena in 1554 and after a long siege the city capitulated to his troops. Having brought many other parts of Tuscany under his control, Cosimo then turned his attention to improving Florence. He had the interior of Palazzo Vecchio redecorated and adopted the Pitti Palace as his residence, overseeing the design of the Boboli Gardens. 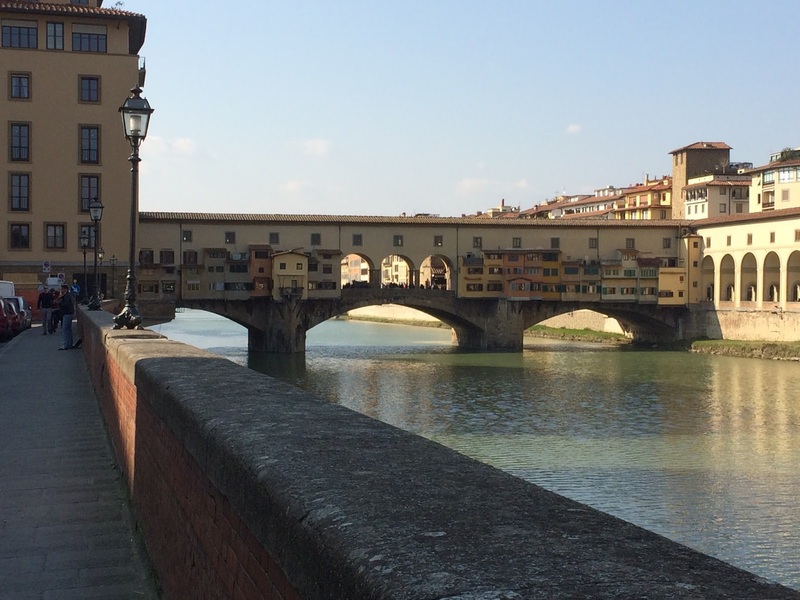 He also had the gallery over the Ponte Vecchio built to enable him to move from one palace to the other easily. Cosimo was deeply affected when his wife, two of his sons and two of his daughters all died within a few years of each other. In 1564 he handed over the Government of the city to his eldest son, Francis. In 1569 Pope Pius V conferred the title of Grand Duke of Tuscany on Cosimo. He retired to live at his country residence, the Villa di Castello, where he died in 1574. 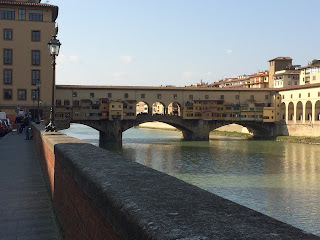 The Ponte Vecchio was built in 1345 and is the oldest bridge remaining in Florence. The medieval workshops inhabited by butchers and blacksmiths were eventually given to goldsmiths and are still inhabited by jewellers today. The private corridor over the shops was designed by the architect, Giorgio Vasari, to link the Palazzo Vecchio to the Palazzo Pitti, via the Uffizi, allowing the Medici to move about between their residences without having to walk through the streets. Work on the Uffizi began in 1560 in order to create a suite of offices (uffici) for the new administration of Cosimo I. 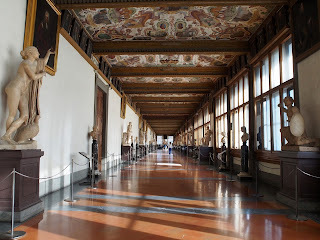 The architect, Vasari, created a wall of windows on the upper storey and from about 1580, the Medici began to use this well-lit space to display their art treasures, starting one of the oldest and most famous art galleries in the world. 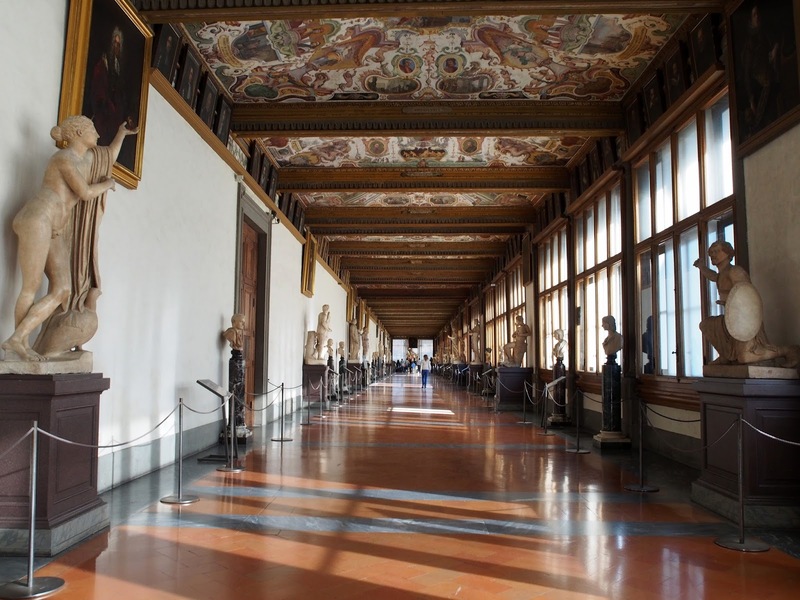 The present day Uffizi Gallery, in Piazzale degli Uffizi, is open from 8.15 am to 6.50 pm from Tuesday to Sunday.